Wonderful Stocking Stuffer for your kitty! It is a cute little reindeer head com.. This kitty lure is made from marabou feathers and is sure to keep your special kitty busy and happy ..
Keep your cat busy with this fun interactive cat toy. With Kitty Lure tied to the end, your cat will.. Your kitty will love this lucky ladybug that is stuffed with organic catnip! The body is made of fle..
What Fun! A purrfect place to play and hide make a needed escape! 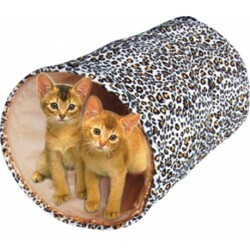 These tunnels are expandable wi..
Adorable play-n-squeak holiday cat toy! Include catnip and also squeaks! Great for interactive..